With October being National Breast Cancer Awareness Month, we wanted to spotlight an organization established to unite the furnishings industry in the battle against breast cancer. 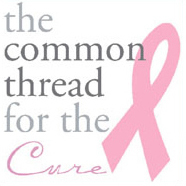 The Common Thread for The Cure Foundation provides practical support for families in the home furnishings industry who are facing the challenges of breast cancer diagnosis and treatment. This support makes an important difference in the lives of our colleagues and their families by helping them meet their bills, cover transportation costs, and go on with normal life as much as possible. The Common Thread for The Cure Foundation’s practical and meaningful approach to improving the daily lives of families is powerful. We as an industry should be proud to be a part of this endeavor. To learn more about the foundation, or to make a contribution of your own, please visit their website at www.commonthread.info.